This Kaiseki/Kyo Ryori(Kyoto Cuisine) restaurant is located a 5-minute walk from Karasuma Oike Station. Founded in 1870, it is one of Kyoto’s most prominent famous restaurants. The dishes are made with seasonal ingredients produced in Kyoto, and they offer high quality flavors as well as beautiful presentation. Their cuisine is skillfully made according to time-honored techniques, with delicate flavors and rich aromas. Using unique methods to bring out the best in the ingredients, they produce flavors with an originality you cannot find anywhere else. If you like sake, be sure to enjoy some with your meal. The restaurant building is a renovated machiya townhouse, and it has its own garden as well. From the counter seats, you can watch the chefs as they prepare the food up close. It is neat and clean, and you can enjoy a traditional Japanese atmosphere to the fullest. There are many chefs who went on to open their own restaurants after training on the job at Muromachi Wakuden. These chefs have created popular restaurants that serve cuisine that can satisfy the standards of Kyoto gourmets. In other words, Muromachi Wakuden has been a steady source of excellent chefs. This fact is one of the things that makes Muromachi Wakuden famous. This full course meal includes eight dishes and two desserts, with green tea and black bean tea. They use fresh ingredients produced in Kyoto as much as possible. The dishes all have a careful balance of textures and aromas that are sure to be memorable. The dish in the photo is a mix of kuruma shrimp, whelks, and angelica sprouts tossed with gelatin. Each mouthful carries the fine aroma and delicious flavors of fresh seafood. One of the eight dishes is white rice served hot from an iron kettle. You will definitely be surprised by the resulting sweetness and pleasing stickiness this gives the rice. *The details of the full course meals vary depending on the season and deliveries. They also have a selection of sake that pairs well with the food. In addition to Kyoto, they also have sake from Shiga and Niigata, which are well-known for the quality and flavor of their sake. If you are unsure which sake to choose, let the staff know the kind of flavor you prefer. If you do, they will choose suitable sake for you. Good sake helps to enhance the flavors of a good meal. 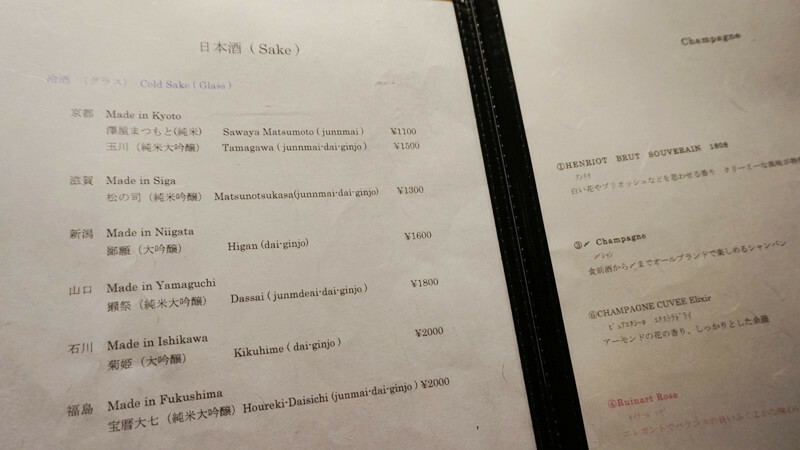 *They also have a selection of other drinks such as wine and whiskey in addition to sake. While this full course meal is more expensive than the other course meals, it also uses ingredients of the highest grade. (Portion sizes are roughly the same as the other course meals) The dish in the photo is ”Shabu shabu of Wagyu and Sansho Flowers.” Wagyu beef and sansho (pepper tree) flowers are lightly braised in a dashi broth. The beef is extremely tender, and you can enjoy the delicious natural flavor of wagyu beef. The sansho adds a slight spiciness and a crisp texture. The dashi broth is rich, with a deep and complex flavor. Use your spoon to drink it. *The details of the full course meals vary depending on the season and deliveries. *”Shabu shabu of Wagyu and Sansho Flowers” will be served from mid-April to the end of May. There are food and drink menus with English. 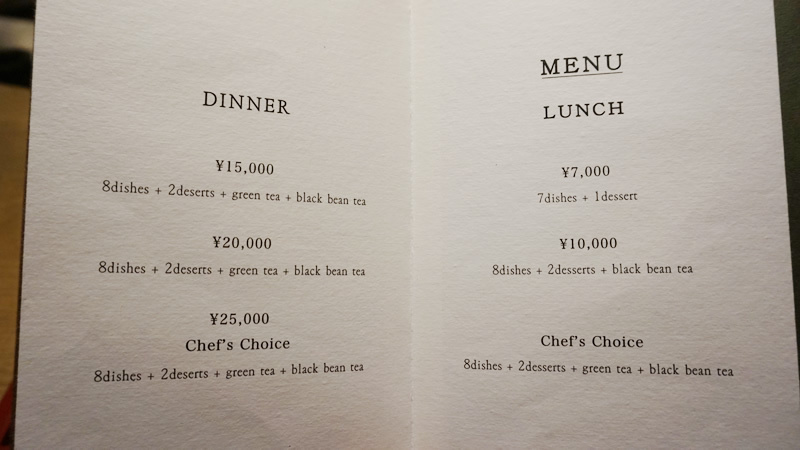 For Dinner, the 20,000 full course meals are enjoyable enough on their own, but if you really want to experience Muromachi Wakuden to the utmost, you should order the ¥25,000 Chef’s Choice full course meal. This restaurant is recommended for people who want to enjoy Kaiseki/Kyo Ryori(Kyoto Cuisine) in Kyoto, but cannot afford to spend too much money. The interior is exactly the sort of thing that comes to mind when you think of an authentic Japanese restaurant in Kyoto, and it is the perfect place to enjoy cuisine carefully crafted skilled veterans from the restaurant world. It feels very fancy, so there may be a slight air of tension, but this is just another part of the charm of Kaiseki/Kyo Ryori(Kyoto Cuisine) restaurants. If you come to Kyoto, please enjoy that special tension too! Counter seats are fine for a group of two, while a table or private room is good for groups of three or more. Reservations are kindly accepted via telephone. Be sure to make reservations before you arrive. The prices also include sales tax and a service fee. The restaurant receives many customers from overseas, so they have English menus and the staff will communicate with people who speak foreign languages with gestures.